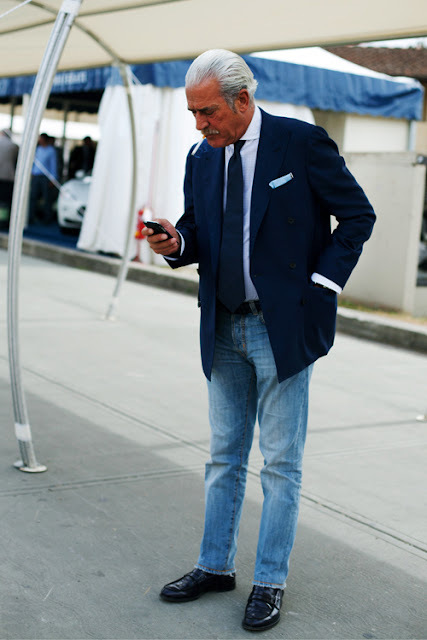 Sooner or later the middle-aged man in search of style will have to establish his position in the blue denim jeans and the older man debate. Or so we are led to believe. I don't think there needs to be any debate. We can do what we like, frankly, and should ignore those who say otherwise. Most men of a certain age were wearing jeans decades ago; why should there come a time when we should stop wearing them? Mind you, care needs to be taken, as this picture shows. 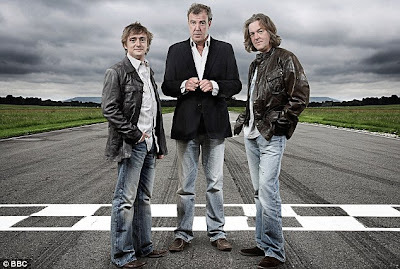 However, if there are any sartorial errors being made in this picture by Jeremy Clarkson and his colleagues I would argue that they are nothing to do with a decision to wear jeans per se. It is more a question of how they are worn. So, how should jeans be worn as we journey towards middle age and beyond? 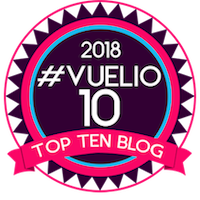 Well, I'm going to duck that one as I intend to avoid being dictatorial on this blog. I leave that to fashion and style experts. I am willing to stick my neck out and say how I would wear jeans, but I do so simply to throw out ideas, not tell others how to do it. Firstly, my jeans should fit properly, not be too baggy, long, short or tight. 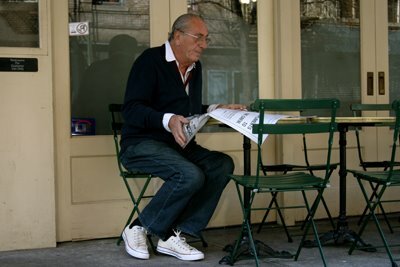 Secondly, I don't wear jeans with white trainers, tennis shoes, Converse shoes etc - my personal view is that it doesn't work with an older man. Brogues are, for me de rigeur, with jeans. Thirdly, I wouldn't wear over-distressed jeans with holes and patches unless I have worn them out myself. I hate artificially-induced age in objects like clothes, furniture and pictures - it's just fake, and that's bad. I favour turn-ups on jeans - they look good with brogues. Here are a few pictures that I rely on in evidence. Please study them and see whether you take a similar view to me or not, then wear jeans as you want, not as others say you should. I'm not going to say what my view is of each photo. Hello Grey Fox - nice to meet you! Thanks for leaving a comment on my blog. I can't bear the Top Gear look, it's hideous. 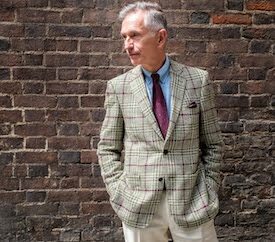 Jeremy Clarkson et al need to check out The Sartorialist's photos of older men for ideas on stylish dressing at a certain age. Agree with you about brogues - and love that close-up photo. I first realised my tastes had changed (or perhaps early middle age had set in!) when I went in to one of my favourite retailers and with more annoyance than I intended asked why they didn't have 'proper' jeans anymore?! Smart dark denim and brogues have become a staple for me and as per your recommendation, I will be visiting Loake this coming week for my next pair! Thanks Mishaal - enjoy the Loakes! GF. Another great blog. My personal favourite is the dark blue jeans turned up with the brown brogues. I like the white denim with navy socks look too. For the record, I am 47. An excellent post, and I generally agree with you, though I remain unconvinced by jeans with a crease ironed in - to me, jeans of whatever colour are still primarily casual wear, and the crease just looks overly fussy. On which note, brown or black leather boots (whether the smartness of the Chelsea or a more relaxed style like a comfortable work boot) also work well with jeans on those of us too old to wear trainers convincingly, and are again a touch more casual than brogues. I wish that denim jeans would disappear off the face of the earth except when worn for the purpose for which they were invented - what the Americans call "yard work". Too hot in summer, not nearly warm enough in winter, highly absorbent of water - surely an invention of the devil! Sports jacket, open-necked shirt and jeans - a look one sees all too often - ugh! Jeremy Clarkson's look is emphatically NOT one to be copied. Jackson Pollack rocked the denim as did many an artist back in the day. 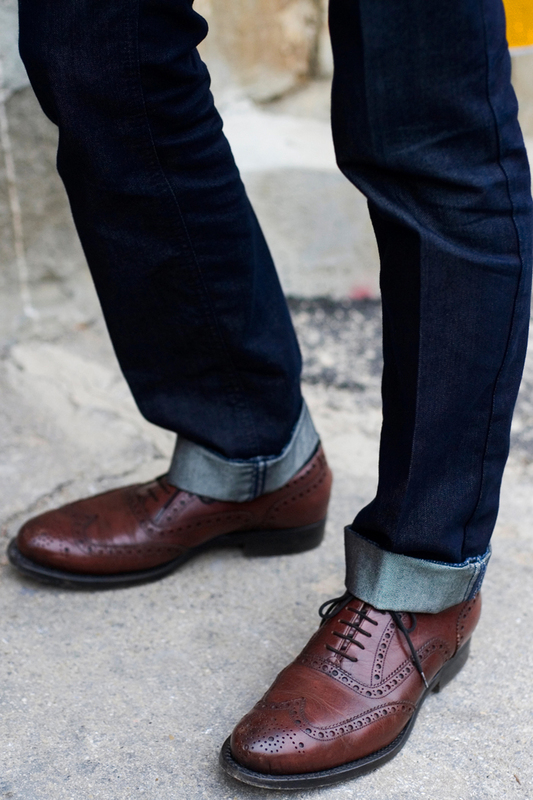 Yes definitely brogues with raw denim but good brogues and jeans (i.e.not cheap) that will age well together. I favour the Loake Royal in oxblood with Edwins and a bold sock. I favour Levi 501XX selvedge jeans with British made brougues, loafers or monk shoes with a tailored jacket. I also think the american look with jeans and Redwing style or Engineers boots suit the older gentleman with checked shirt and leather jacket for the casual look. Shirts out (on occassion) as long as the tail is tailored for such an outing. 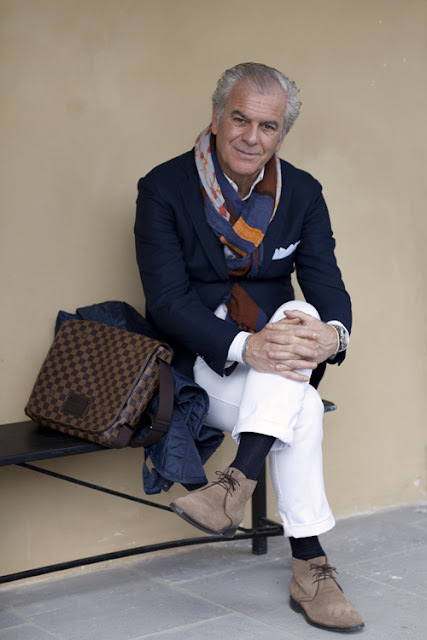 Personally, being a man of the 'over 50 persuasion' I've absolutely no intention of being pushed in any particular direction as far as wearing jeans is concerned (or fashion in general). I still dress the same as I've always done, I don't believe you should change the way you look just to suit what everyone else thinks. The real question should be, should people in the public eye like politicians and celebrities get away with dressing like Jezza... I really hope he makes an effort to update his look for the new series about to come out on Amazon!